On Sunday I woke up early and thought about the things that needed to be done. Then I thought about the things I wanted to do instead. Which was sleep in and that is what I did. Then I got up and thought about the things that needed to be done. Then I thought about things I wanted to do. Like have a cup of tea. Read the paper. Sit around in my pyjama’s. And that is what I did. After I had a shower I thought about the things that needed to be done. Then I thought about the things I felt like doing. Like raking up the leaves in the backyard. Playing with Mr Benny. Having a cup of tea. Surfing the net. And so I did those things. In the late afternoon I thought about things that needed doing. Then I thought about what I felt like doing and did that instead. Went grocery shopping at my favourite supermarket in the suburb I want to move to one day. After I did the food shopping I thought about what I should do. Then I thought about what I felt like doing and did that. Had a coffee and lunch at my favourite cafe. Read the paper. Ate a teeny weeny cup cake that had pink icing and a pink flower on the top. The flower was sugar sweet and crunchy, in the centre was a silver pearl of sugar. I ate the petals one at a time. The coffee was strong and had a heart shaped pattern on the top. I stirred the coffee and watched the heart disappear into the brew for me to drink. At the supermarket I did not put all the groceries in neat order. I just dumped them on the counter in no particular order at all. Bar code not facing up. Things upside down. Fridge items mixed in with pantry items. Later that evening I thought about what I had to do and what I wanted to do. Get my tax paperwork ready for the accountant. So, I did that and felt very relieved to have that sorted. I don’t know exactly what I did for the rest of the evening but I do know that I did what I wanted. And not what I thought I should do. Your Sunday sounds like mine! I kept thinking about things I needed to do and ended up taking Gracie for a long walk in the rain, taking a nap, and going to a movie with the girls. At least you did a few constructive things. I blew the entire day off. Unfortunately, I’ve plenty of regrets today for not getting important things done. 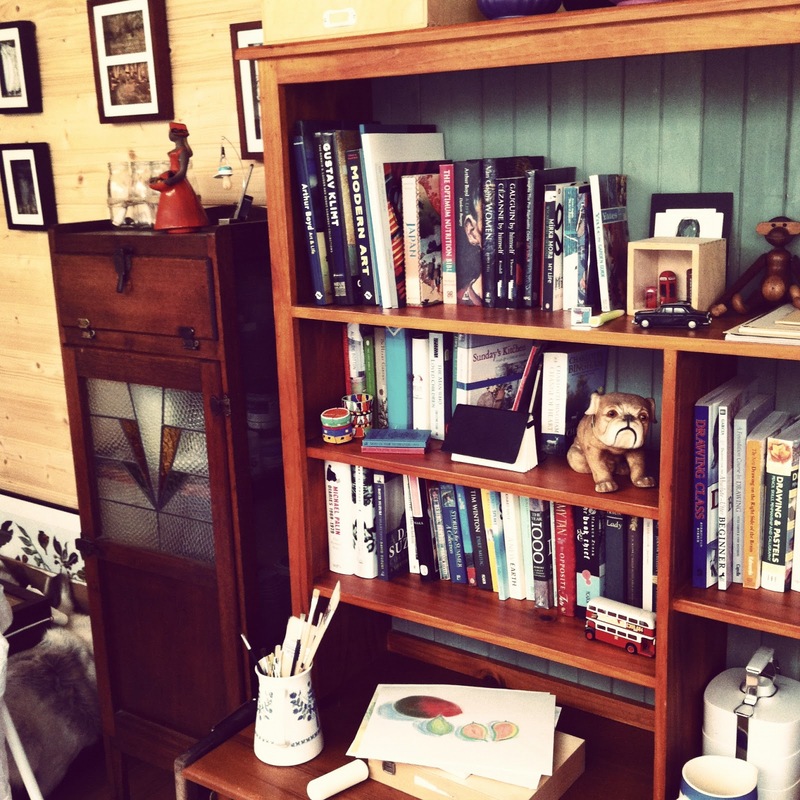 The things on your book shelves look nice and neat….the wooden monkey is cute!! KYLady: I hear you on the impact of doing what you want. Things did not get done and my house looks very scrappy. Behind with the laundry. I wore my jeans four days running (TMI?). Bookshelf is in the studio. My fav books are on it. The monkey is from when I was little. It is a Danish one by Kaj Bojesen and I have such fond memories of it. I think when we all work full time jobs we deserve some weekends off and doing nothing. Ms Topiary: I have to tell myself that now and then.